VERY FINE. 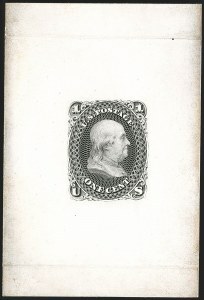 THIS IS THE ONLY RECORDED EXAMPLE OF THIS NATIONAL BANK NOTE COMPANY ONE-CENT PROGRESSIVE DIE ESSAY ON GLAZED CARD. VERY FINE. 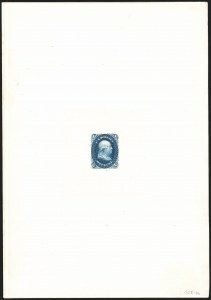 ONE OF ONLY TWO RECORDED EXAMPLES OF THIS NATIONAL BANK NOTE COMPANY ESSAY. VERY FINE APPEARANCE. 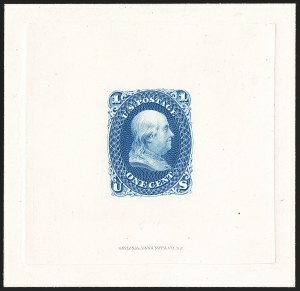 EACH OF THESE SMALL DIE TRIAL COLOR PROOFS FOR THE ONE-CENT 1861 ISSUE IS THE ONLY RECORDED EXAMPLE. The Scott listings for 63TC2 include Black as well as Green, Brown, Red, and Orange. 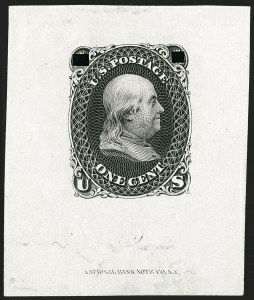 We offered the Black as part of a set of 1c-90c 1861 small die proofs in 2015. The Yellow shade offered here is unlisted in Scott. 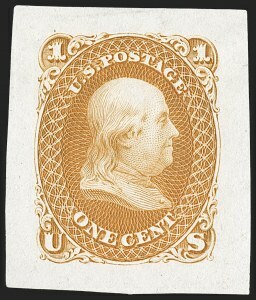 The 1c denomination is the only value of the 1861 Issue that has small die trial color proofs. As such, this set is unique, not only for the 1c but for the issue.